The album that launched the progressive rock movement, King Crimson’s debut is a still a masterpiece 40 years on. With only five songs on the original release and the memorable cover art, In the Court of the Crimson King preoccupied itself in making a bold artistic statement rather than being a vehicle for a hit single. 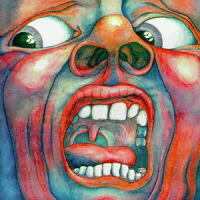 The opening rocker “21st Century Schizoid Man” still burns with intensity with Robert Fripp’s guitar and bassist Greg Lake’s distorted vocals; “I Talk to the Wind” and “Moonchild” are gentle ballads verging between pop, avant-garde and jazz; “Epitaph” is a haunting number; and “The Court of the Crimson King” brings everything to a grandiose and majestic end. Certainly the album’s sound no question is dominated by the explosive jazz-inflected drumming of Michael Giles and the Mellotron/woodwinds playing of Ian McDonald. Remarkably this lineup only lasted a year. In addition to featuring the original album, This special CD/DVD anniversary edition of In the Court also contains bonus tracks (including the full version of “Moonchild”), the record in 5.1. surround sound, and a brief black-and-white filmed performance of the original Crimson performing “Schizoid Man” at Hyde Park in ‘69 as the opening act for the Stones.